Tallinn. Too tempting to miss. It’s early evening in Tallinn, and I’m standing in the Song Celebration Grounds where only a few days ago over 300,000 people crammed into here and joined with some 20,000 others on stage to sing their hearts out for Estonia. This was the climax to the simply named Song and Dance Festival, a four day celebration that takes place once every four years to rejoice freedom. Not something we in the West might easily understand, but when you have been slaves to Swedes, Russians (three times) Germans (twice), Poles and Danes throughout your history and only gaining independence in 1991, I think some hearty singing and dancing is perfectly acceptable. But still, 300,000 people is a pretty special event by anyone’s standards. This is just one example of why Estonia should be on your radar for at least a weekend break. Estonians are, despite their years of oppression, a genuine and warm people who enjoy celebrating anything at a moment’s notice with great beer and food long into the night. With the city a former Capital of Culture and with low cost carriers regularly coming into Tallinn airport (which is no more than 15 minutes drive away from the Old Town), it’s never been a better time to try it out. 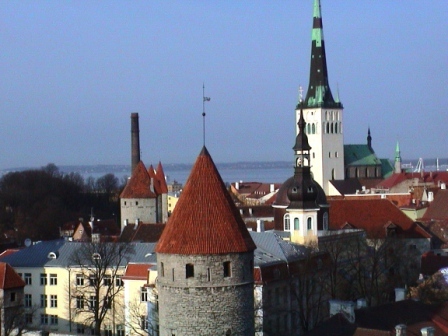 In many respects, Tallinn for many people, conjures up images of drunken stag parties and bawdy louts. The reality is you may find a few stag revellers on a weekend, but these days the town proudly celebrates its history and culture simply by letting you explore the delightful old town’s fairy tale like buildings and courtyards. 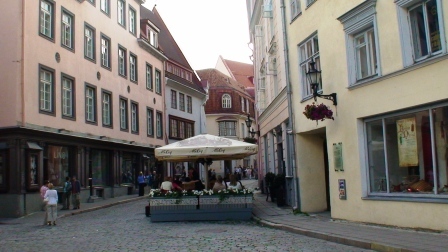 Tallinn’s Old Town is a chocolate box beautiful, perfectly preserved 13th century medieval port town with genuine cobbled streets, wooden beamed merchant houses, windy lanes and tiny hidden courtyards. You can spend hours just wandering around here, maybe popping into a chocolate shop or two for an occasional home-made nibble and even better, taking a leisurely meal in one of the many fine restaurants on offer. After all, being just a stone’s throw from Finland, and pretty close to the Russian and Latvian borders, it offers many opportunities for a wide choice of food styles. For centuries, the Old Town has been split into two distinct sections. The Lower Town, which enjoyed political and social autonomy as an independent town (and of course had the docks as a major selling point), and higher up the Toompea Hill district, where the posh folks lived gazing down on the peasant townsfolk from their lofted perch. Today, climbing up to the top of Toompea will give you some magnificent views of the Old Town and the Baltic Sea beyond. The Tallinn Old Town night life is legendary, and there are countless clubs, restaurants and pubs to enjoy a great night out particularly when you consider that many of the visitors will be either Finns or Russians, so vodka will be the order of the day. And it’s a weird feeling to experience very short nights in the summer months as it only gets dark around midnight and then gets light again around 3am. Of course winter is quite the opposite with only a few hours of daylight, but then again, tucked up in a blanket sipping hot chocolate surrounded by snow is just too romantic for words. 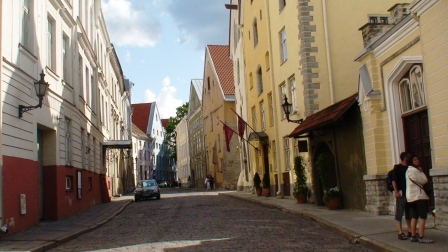 So, with freedom comes much rejoicing and let’s face it, if you had been oppressed for countless numbers of years, you’d have a lot of rejoicing to catch up on.Visit Tallinn and just embrace everything she offers you. You will take back many fond memories I fancy. I love the sound of Tallinn. 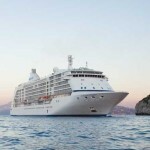 Where can I stay and eat? There’s a hotel in Tallinn’s beautiful medieval old town that’s got more than a bit of a history behind it. A few hundred years of history to be more precise. The Three Sisters is a luxury boutique style hotel set within three medieval merchant houses. It has character literally pouring out of every crevice, some stunning rooms that fit gloriously into its rustic style and top notch food and service. It’s tucked away in a quiet street but no more than a few minutes’ walk from the main square. It’s a cosy place that you will just fall in love with. Altogether different, though uber chic, is its sister hotel, Telegraaf. This is a five star property right in the heart of the Old Town and was formerly the old bank and post office (hence the name). In fact, they’ll tell you that some of Tallinn’s older generation still bring their letters here for posting. It’s a top end hotel with a wellness spa, indoor pool, Russian style restaurant complete with a string quartet and ultra modern rooms. There is simply a mass of choices, so decide on the type of food first and then pick out a restaurant. 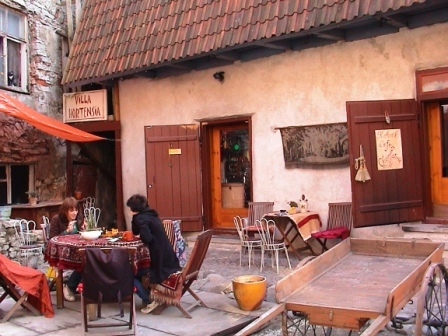 For lovers of Russian cuisine, or anyone who fancies a hearty night out should go to Tallinn’s Restaurant Troika, one of the landmark cellar restaurants in town. You’ll get copious amounts of vodka, heaps of traditional Russian food, and to top it all some boisterous singing and dancing girls. Try the pickled cucumbers with honey – delicious.